Thanks to Nobel laureate in economics Dr. Milton Friedman, who was born in New Jersey to Jewish Hungarian immigrants, we have a legacy of the Index of Economic Freedom. Friedman was an early proponent of measuring and monitoring economic freedom around the world. In the 2016 Index of Economic Freedom, jointly published by The Wall Street Journal and the Heritage Foundation, Israel reached its highest score ever. With an overall score of 70.7, Israel is considered “mostly free” in the annual study. Israel is recognized for the highest concentration of hi-tech start-ups per head in the world and as a vibrant democracy, which is unique within the Middle East/North Africa region. In the regional rankings of the 2016 Index, Israel is tied in third place with Qatar: 1. Bahrain (74.3); 2. United Arab Emirates (72.6); 3. Israel (70.7); 3. Qatar (70.7); 5. Jordan (68.3). • Market openness (trade freedom, investment freedom, financial freedom). Every economy receives an overall economic-freedom score based on the scores of 10 economic freedoms, each of which is graded on a scale from 0 to 100, with 100 being the best. The 10 components of economic freedom are then equally weighted and averaged to produce an overall economic-freedom score. The index seeks to answer the questions of essential interest to the average person: Does the government let me keep my money, or does it confiscate a lot of it as taxes? Is private property protected in general? Can I get a job easily? If I run a business, can I hire and fire easily when I need to? Can I buy and sell easily within the country and across its borders? Does the government compete against private businesses, or does it want them to thrive? Shall I be able to enforce my contract? How important is corruption in this picture? 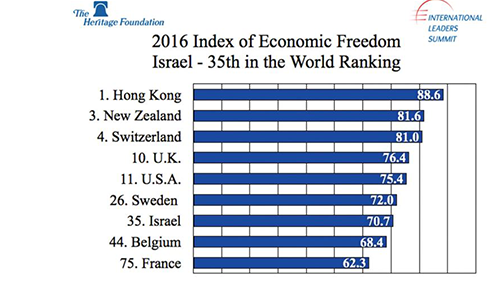 Israel’s overall score improved by 0.2 point year-on-year in the 2016 Index of Economic Freedom. Improvements in categories of investment freedom (+5.0 points), monetary freedom (+2.6) and government spending (+1.0) outweighed a decline in labor freedom (-2.5), business freedom (-1.8), fiscal freedom (-1.3 points), freedom from corruption (-1.0) and trade freedom (-0.4). However, Israel dropped by two places, from No. 33 to No. 35 in the world ranking, with Botswana and the Bahamas outperforming Israel. In the Middle East/North Africa region, Israel climbed up from No. 4 in 2015 to No. 3, which it shares with Qatar in the 2016 Index, slightly lagging behind Bahrain and the United Arab Emirates. Property rights (75.0), business freedom (70.6) and financial freedom (70.0) are rated as mostly free. Labor freedom is rated as moderately free (64.6). In the category of freedom from corruption (60), Israel is rated as moderately free. Yet, after deteriorating year-on-year, its freedom from corruption is on the verge of being mostly unfree. This score is relatively high in Middle East/ North Africa region, with only United Arab Emirates (70) and Qatar (69) performing better than Israel. However, this is a relatively low score compared to countries in Western Europe and North America. Israel’s largest weakness in the 2016 Index of Economic Freedom is the category of government size, which includes fiscal freedom and government spending. Fiscal freedom: High incometax rates (top personal income-tax rate of 48 percent) and corporate tax rate of 26.5%, with the overall tax burden at 30.5% of total domestic income, place Israel at No. 166 in the world out of 178 rated countries. Competing for new investments and jobs, countries around the world have been significantly reducing personal and corporate tax rates and have been outperforming Israel in fiscal freedom. Government spending: Israeli government spending at 41.3% of GDP, continued budget deficits and public debt at about 70% of GDP place it in the repressed economy category. Indeed, Israel’s geopolitical position requires above-average government spending related to maintaining superior security and military strength. However, in order to increase investment, employment, private spending and to grow its economy at a higher rate, Israel should examine the opportunity to reduce taxes. With higher GDP and lower tax rates, Israel will still be able to collect the same or higher amount of tax revenues and meet its necessary government spending, albeit, with a lower burden on taxpayers. What struck us the most during our several visits to Israel were relatively higher prices of consumer goods and lack of competition in the services sector, also reflected in elevated pricing. In this case, greater attention must be given to the possible barriers to entry. 1. Property rights: Strengthen the rule of law. 2. Freedom from corruption: Eradicate corruption. 3. Fiscal freedom: Reduce taxes. 4. Government spending: Cut government spending. 5. Business freedom: Simplify the process to register, operate and close a business. 6. Labor freedom: Enable employers and employees to freely contract the terms of employment. 7. Monetary freedom: Maintain price stability through low inflation and allow market pricing to prevail. 8. Trade freedom: Eliminate tariffs and nontariff barriers. 9. Investment freedom: Enable investment in all sectors of the economy to domestic and foreign investors without barriers. 10. Financial freedom: Enable greater competition of the financial sector and encourage capital-market development. While economic freedom is in decline in a number of countries around the world, we should be reminded of Friedman’s famous statement: “Government has three primary functions. It should provide for military defense of the nation. It should enforce contracts between individuals. It should protect citizens from crimes against themselves or their property. When government in pursuit of good intentions tries to rearrange the economy, legislate morality, or help special interests, the cost comes in inefficiency, lack of motivation and loss of freedom. Israel’s leaders have an opportunity to work on reducing taxes, cutting government spending, reducing corruption in the public sector, removing the barriers to entry and increasing the flexibility of the labor market. This would lead to higher economic freedom for Israel’s citizens and taxpayers, with opportunities for new investments, new employment, higher economic growth and an increased standard of living for the country’s citizens. Natasha Srdoc and Joel Anand Samy are cofounders of the International Leaders Summit.